The scriptures like Vedas and Upanishads reveal the eternal truth in elaborate details. Bhagawad Gita is the essence of all that scriptural knowledge. It is the crowning glory of all scriptures. Bhagawad Gita is unique because the principles and values it highlights are relevant for all times and universally applicable. 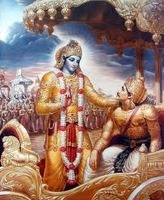 Bhagawad Gita assumes importance because it is the advice which Lord Krishna has given directly to his disciple, Arjuna. The fact that it takes place in the battle-field is also significant because it symbolizes life itself as the battle field where one has to face many challenges. Arjuna symbolizes the individual who is at cross-road unable to decide what is right and what is wrong. On one side, his duty demands that he wages war with Kauravas and on the other hand his mind pulls him back to his own passions, attachments, likes and dislikes. Gita shows how one should live in this world in accordance with truth and perform the duties assigned to him dispassionately and attain the highest end of spiritual freedom. The Karma Yoga (the path of action) is more suited to the people of this age who are actively engaged in the performance of their duties. It is in the context of Karma Yoga, Bhagawad Gita becomes more relevant. The education we receive, the profession we occupy and the aspirations we set are all result-oriented. Any action done sincerely and efficiently will bring good result but when an action is done in expectation of a result it would bring adverse reaction. Having assigned certain duties in the designated area of our activity, we are only expected to perform them satisfactorily. The problem comes when we identify ourselves with the duties and think that we are the doer. The real Karma Yogi does action without the sense of doer-ship. Though the action would bear fruit, he does not expect them. 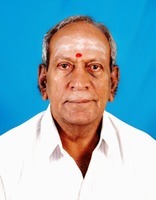 He is a mere actor in a play, doing the acts and speaking the lines without being involved in it. He is always conscious of his Self and does not associate himself with actions which are performed by the body and mind. All scriptures, Pundits and scholars agree that devotion is fundamental and a necessary condition for one to progress in his spiritual journey. It is both a means and an end in itself. Devotion which is the expression of love towards God springs from the heart and seeks unity with God. It should be noted that Gita has not specified devotion as a separate path because devotion is most fundamental in any path. It is the first step and is continued till the ultimate goal is achieved. The path of knowledge and the path of Karma can easily be attained by being a devotee. What is achieved through the hard path of meditation and sacrifice is easily achieved by the simple method of devotion. Lord Krishna says: "Those devotees, who have no other thoughts except that of mine, who constantly think of Me, worship Me, without any other attachment, who are ever united in thought with me, are very dear to me and I take care of their full security. (Ananya Chinthayantho Ma IX 22). This clearly indicates that the God takes sole responsibility for the well being, protection and prosperity of his devotee. Almost all the 18 chapters of Bhagawad Gita emphasise the importance of devotion. It may be relevant to quote an incident from Mahabharat which shows how much importance Lord Krishna has attached to the subject of devotion. Krishna has taken the role of an ambassador of peace and came to the Court of Kauravas for the restoration of Pandava's Kingdom. Despite Krishna's pleading, Duryodhana stuck to his stand and refused to give back even an inch of land to Pandavas. However, in his anxiety to show minimum courtesy to Krishna, Duryodhana invited Krishna for a dinner. Krishna said: "Meals are taken under two circumstances. One is when is the meal is offered with love and another is when the taker is almost in a state of starving. Since you have no love in you and I am not dying of hunger, none of the two circumstances is present here and therefore, I decline your offer". Krishna then proceeded to the cottage of Vidhura his ardent devotee, uninvited. Having come to know this, Bhishma, and elders like Drona, Krupa, Bahlika and others called at Vidhura's small cottage and invited Lord and Vidhura to their own houses but the Lord politely declined and preferred to enjoy the simple lunch offered by his loving devotee, Vidhura. There is a popular Indian song which runs on these lines: "Refusing the rich and sumptuous dishes of Duryodhana, the Lord went for a simple meal with half-cooked vegetables at Vidhura's".